If you've never had a pavlova for dessert, you're in for a treat! In my recipe, I top vanilla meringue with lemony coconut cream, berries & fresh mint. For me, there’s such an overlap between cooking and traveling – I just love navigating new recipes as much as I love exploring new places. I’m in my happy place when I’m getting lost, trying new things, and tasting new foods… whether in my kitchen or somewhere around the world. We’ve had a serious case of wanderlust lately. Jack and I have spent a good amount of time in Europe and Asia, but one place that’s been high on our travel list is New Zealand. By an amazing stroke of coincidence, Air New Zealand approached us to partner up for their Calling all Travelers campaign. What does that mean? It means you can win a trip to New Zealand by creating your own action-packed-food-&-wine-or-whatever-you-like itinerary. And while we’re all planning our Kiwi adventures (and maybe sampling some New Zealand wine on the flight…), why not be adventurous, start at home, and make an NZ recipe that you’ve never tried before? Pavlovas were created in honor of the Russian ballerina Anna Pavlova in the 1920’s while she was touring through New Zealand. We had fun recreating this meringue dessert. 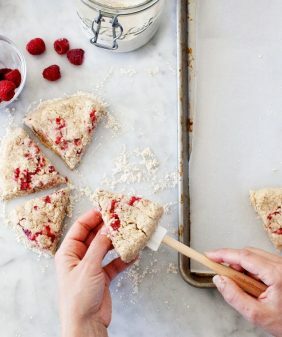 I had never made one before but I love a new recipe challenge. They’re crispy on the outside and are sort of like a marshmallow in the center. They’re usually topped with whipped cream, but I used a lemony version of my go-to coconut cream with berries and fresh mint to make this pavlova dairy-free. If you’re like us and are looking for a spring getaway, (with comfortable seating of course! ), check out some really great travel deals Air New Zealand is offering. Or click over and build a customized vacation itinerary (before March 31st) for a chance to win a trip of your own! This post is in partnership with Air New Zealand as part of their Calling All Travelers campaign. Check out their video and round trip tickets for as low as $1K! Thank you for supporting the sponsors that keep us cooking! 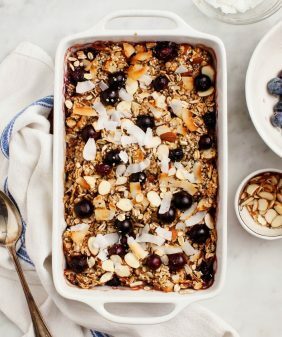 Use whatever in-season fruit you like for the topping here, and if you're not dairy-free, a dollop of regular whipped cream would be delicious in place of the coconut cream. For the pavlovas, I followed the instructions from this recipe exactly (using an electric mixer to beat the egg whites). Let them cool to room temp before topping with the cream. Make the coconut cream: remove your coconut milk from the fridge and carefully scoop the thick solid part off the top. Save the watery part for another use. Use an electric mixer to whip the coconut cream until fluffy. Add powdered sugar, vanilla and lemon and mix again. 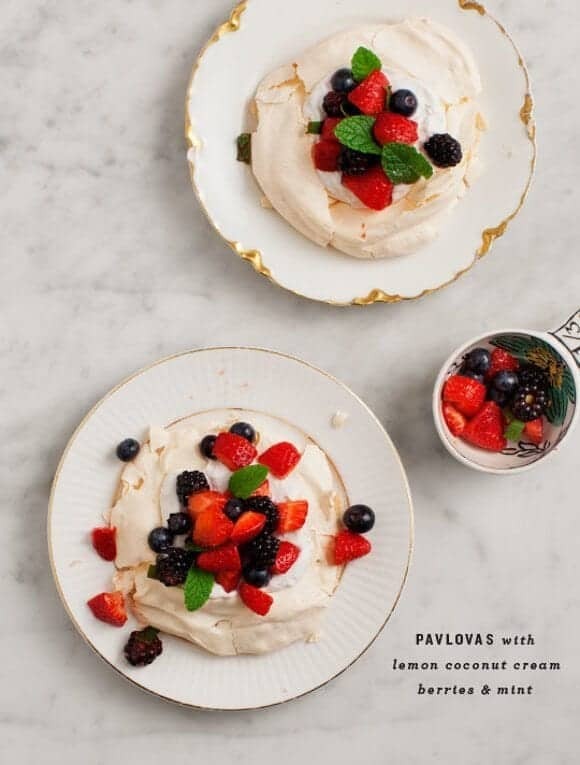 Top pavlovas with a spoonful of coconut cream, berries and mint. For the coconut cream: every now and then you get a can where the solids won't separate. I've had consistently good luck with the 365 Whole Foods brand full fat canned coconut milk. And/or Trader Joe's sells canned "coconut cream" that doesn't require separating. Pavlova recipe adapted from here and many places on the internet. (2) These Pavlovas look divine! I have never heard of Pavlovas, but now they’re on my list of things to make. Can’t wait to try them out. Thanks for sharing recipes from other countries, it’s always neat to try. Oh my, those pavlovas look heavenly! I have to ask — where did you get that plate with the gold trim in the first photo (the one on top)? My great-grandmother had a set of these and I’ve never seen them anywhere else before! These look great! 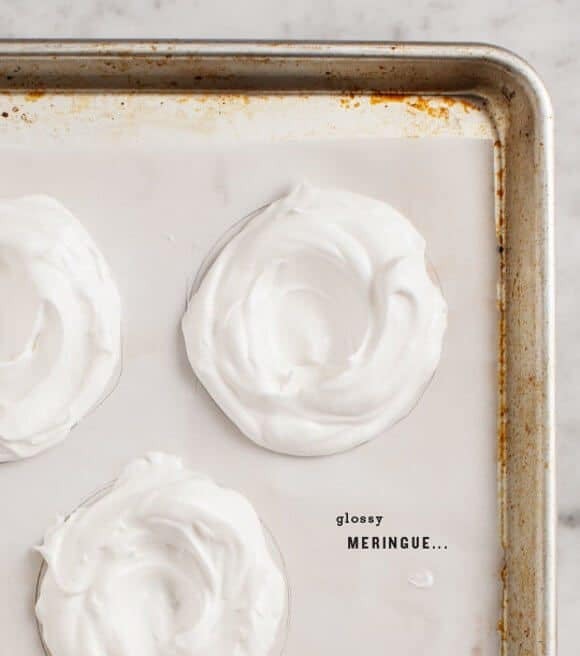 I’ve never made meringue before, but this makes me want to try. 🙂 When the recipe says to whisk the egg whites with salt, I assume that means by hand. Is it ok to use a mixer or would that affect the texture? Thanks! I’ve never made a pavlova either but I’m planning to try soon, and of course your version sounds wonderful. I’d also love to go to New Zealand someday .. it’s on the bucket list! I seriously need to try making pavlovas. They’re so pretty!! I love pavlovas! I was thinking about making one this weekend for spring, so same wavelength! This is gorgeous, I can’t wait to try this recipe! These pavlovas look divine! I just heard of these recently and have been dying to try them. Adding to my must-make ASAP list! Those look delicious! I’ve never tried something like this. My little heart breaks every time I see a meringue or pavlova! Food science, please create a vegan version! These look sooooo good and they remind me of my childhood because at the time, my gran’s pavlovas were my favourite dessert (well, that and lemon meringue pie). 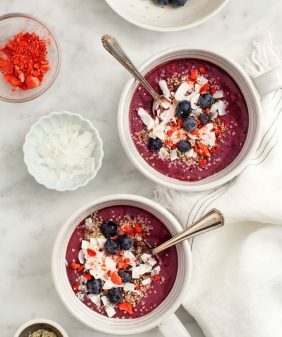 I like mine topped with TONS of berries, so these are right up my alley! This is so beautiful! I am seriously jealous of your food photography skills. Not to mention the recipe sounds absolutely divine. I’ve never seen lemon oil at the grocery store… is this just expressed from the lemon peel, or can you buy it somewhere? Hi Sarah, you can just use lemon zest if that’s easier! I find lemon oil in the baking section with the vanilla extract, almond extract, etc. (Simply Organic makes the one I have). 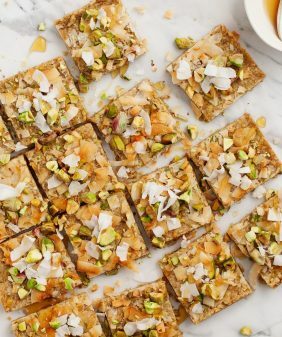 Love your idea of using coconut as a topping! I’m a New Zealander, and pavlova is a personal love. Traditionally, it’s made into a ‘cake’ but there are lots of versions now of single serve pavs. I use white vinegar, not white wine, and this with the cornstarch is what gives it the marshmallowy texture in the center. I love it most with raspberries, although kiwifruit is the trad way to go. I’ve got an absolutely O.T.T. (over-the-top) version on my site http://www.sharedkitchen.co.nz made with Limoncello, raspberries and cream (and it’s in American measures,too), topped with mini meringues! And there are heaps of tips on meringue making. I’d love to meet you in NZ if you return! So lovely! Also, New Zealand?? I’m on it! Clicking over to the site and fingers crossed I win. Someone’s gotta, right? 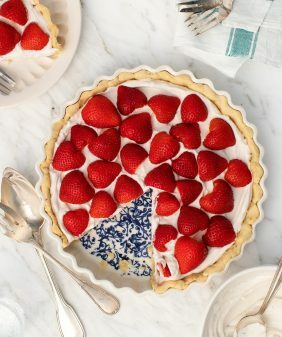 What a pretty dessert! Pavlovas really are lovely 🙂 This variation sounds fabulous! All of your food is so beautiful. I would be honored if you guys would check out my cooking vlog. The kick ash kitchen. Yay – a good ol’ pav! I’m a Kiwi (aka New Zealander) too and pavlova is one of my absolute favourite desserts. I made one yesterday and it was yum. Great idea with the lemon coconut cream. So pleased you have had a taste of our little piece of paradise. I had no idea pavlovas were a New Zealand thing. Yours are just gorgeous and that cream sounds to die for! I’m dreaming of going to NZ too some day :-). this looks amazing!! and love those gold trimmed plates. Expats living in AU and recently went to South Island, NZ; spectacular. The venison and lamb shanks are must tries. Fell in love with a pinot noire named Roaring Meg from a winery outside of Queenstown if you would like a pretaste of to come. Pavlova is also claimed by Aussie’s but as an American they are just delicious. So beautiful! The meringue came out perfect! Mmm these look great. I made a huge pavlova last night with lemon curd and blackberries. I love the idea of mini individual sized portions! How long does the coconut cream keep? I’ve never made it before and am hoping to make/take these somewhere for an Easter dinner. Wondering if I can make it ahead and store it for 24 hours or have to bring the stuff to make it at the host’s like whipped cream? You should be able to make it 1 day in advance and store it in the fridge (it’s thicker and less fluffy than whipped cream). Just keep it separate from the pavlovas until you’re ready to serve. These look so good. 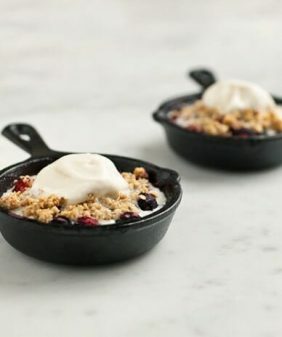 And the presentation is so cute!I would love to make these at home….